Guest also have access to the farm for activities such as mountain biking, walking, bird watching, and photography - the latter by private arrangement. Take a drive into town to enjoy many of the town's best restaurants, galleries and shops. Check in after 3pm. Check out by 10am. No smoking. Well behaved pets only. Thank you to the owners for sharing this little piece of heaven. Your friendly and helpful service was so much appreciated!!! !Our stay was amazing, with lovely times spent in front of the fireplace, reading some of the wonderful books available, beautiful views and peaceful surroundings. 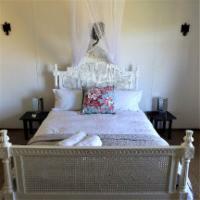 Molweni Cottage is 4.3km from the centre of Camdeboo National Park , the nearest airport 225.2km (Port Elizabeth Airport).